If you are kind of a tincturist you probably have a tincture of cacao shells in your collection. Cacao shells are, to put it simply, a by-product of the cacao processing industry. These shells are usually from roasted beans. One can even buy them at a chocolaterie or a tea shop. They are really a nice ingredient in tea mixtures (one of my favourite recipes I do at home is with cardamom, cacao shells, rose buds, vanilla, cinnamon and a pinch of ambrette seeds) or savoured on their own. When tinctured you can capture this chocolate-ly smell that we are accustomed to when thinking of „chocolate”. And I personally find the tincture to be less sour than the extract I own. Raw cacao shells are a different animal. If you never tried raw chocolate (or raw beans) I’d advise you to do so. Preferably at 100%, with no sugar or other „diluents”. The taste – of course depending on the terrain and the manufacturing process – is somewhat earthy and fruity, some having notes of red wine or melon. I kept the filter that I used when decanting the tincture of raw cacao shells after a few months in a zip lock bag, half a year ago. The smell is still amazing. The opening I’d describe as bitter, smoked ham transiting to light leather with an underlying florality and cresolic notes. Now, in the very dry down it smells of horse and leather, like a saddlecloth. I am offering a limited amount of these raw cacao shells originating from Java so you can make your own saddlebroth. I’d recommend a 10% concentration. The material is very fragrant and high-yield, soaking up a lot of ethanol. A few years back when I got my first bottle of ethanol I literally tinctured anything that came my way. I ordered tons of materials from incense suppliers and herbalists. Once I ordered styrax. Since Cuir Styrax by Prada is one of my favourite fragrances I surely needed this material. Surprisingly, when it arrived it was neither a resin nor some liquid but little pieces of charcoal smelling heavenly. Probably meant to be burnt – I tinctured them. Resulting in a lovely tincture of unknown concentration. I ordered more from another supplier. A big bottle. You know what’s coming next. I encountered styrene. As a regular beginner I blamed it on the supplier. Bad stuff this must be. Nasty solvent residues. I put the bottle aside and forgot about it. Until i learned more about this material and set up an experiment. I diluted 3 g of Styrax Honduras in ethanol (at 30%), took 15 g of charcoal* and dripped the dilution onto it until the charcoal was saturated and repeated this procedure several times as soon as most of the ethanol (and other fleeting molecules, assumingly the undesired ones) had evaporated. After the entire solution was applied I let the charcoal sit for one week and observed the change in smell. I weighted the charcoal. It was 17.8 g. Obviously not only the ethanol evaporated. Then I tinctured it in 26 g of ethanol for two days. The result is amazing. No styrenes. A warm, leathery, animalic smell with a slight cinnamic promise in the background. After filtering the charcoal it still smelled intensely. So, if I would do it again, I took less styrax (maybe 1 g) but diluted at 50% and I made different batches of charcoal pieces, letting them sit for varied periods of time before tincturing them (in more ethanol). Maybe you’ve got a dismissed bottle of styrax, too, that deserves a second chance! *I had bamboo charcoal at hand. Any sort will do the trick, I guess. By the way, placing pieces of charcoal around your work place will significantly reduce olfactory pollution. This is the third batch of ambrette seed tincture I made and the first one that satisfies me. The only reference materials I have are the SCO2 and CO2 extracts I once bought at Liberty Natural. Those extracts are approximately ten times stronger, so I compare my 30% tincture with a 3% dilution SCO2/CO2 in IPM. 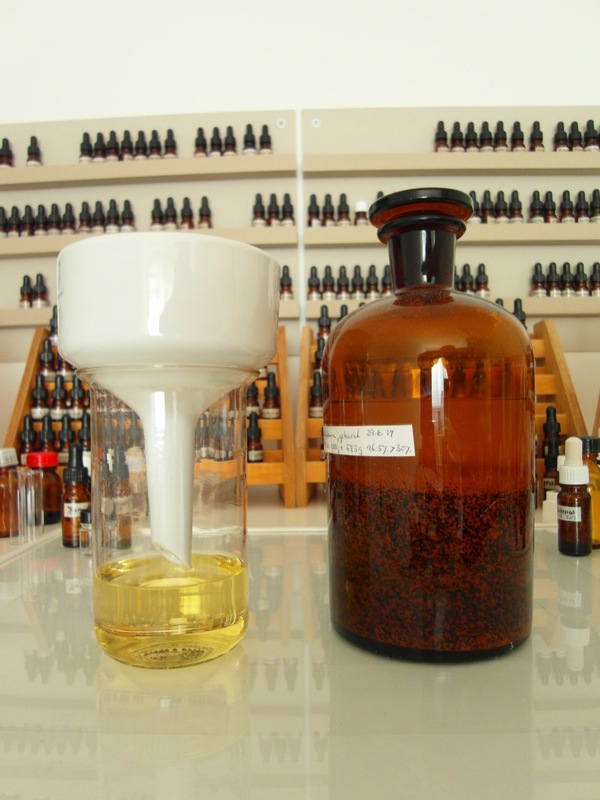 The tincture resembles more the SCO2 and, fortunately, is completely lacking the cumin-like notes the CO2 carries. In the beginning it shows a nuttiness like the SCO2, but dryer, less fruity. And soon develops an amazingly clean, white-musky scent. Longevity on a blotter is at least one day. Sniffing hard I can still detect some traces on the strip after two weeks.